If island privacy is your dream we have a choice location available on Canyon Lake. A nicely treed property only minutes from the landing on the east end near the crossing. A unique opportunity with a total of 900 sq ft composed of a 575 sq ft natural log cabin with a 325 sq ft frame addition. 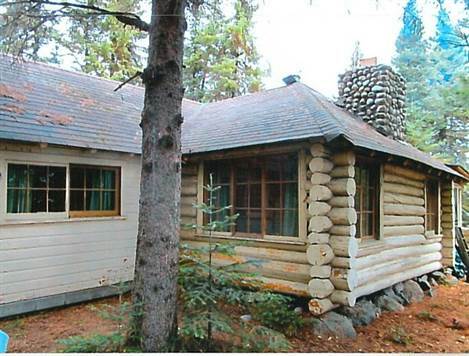 This cabin has a stone fireplace open ceiling and pine floors recently renovated in "like new" condition! The attached foyer and kitchen is nicely finished with pine walls and ceilings and a wood floor. Includes a propane fridge and stove. Cozy up on chilly days by the efficient wood heater! The lot encompasses the entire island!!. Excellent fishery and beautiful surroundings! Asking 149,900.00 US offers considered. For more info call John Ladouceur.